It has been more than a month’s restriction in Kashmir. I’m writing in the morning, whilst birds chirping that melodic twitter, sedating tranquility. The frogs have stopped croaking. There is a flash of white on the grass. The sky is painted morning blue, and I can feel a cool breeze piercing my window, as I try to jot through my faculty of thinking. About nineteen natives have been killed since the past month. It included young children and youth. It also included women and men, who were the lynchpins of their family. For us, life would move on, but for their sorrowing families, the struggle has just started. Kashmiri mornings are full of causerie, but will their mornings be peaceful? It would start with a suffocating silence which wouldn’t end till the night. Pain. Misery. Melancholy. Suffering; would be ruling their minds and hearts, and it won’t cleanse away easily. Who knows how many times, those grievers would have cornered themselves, in that acute misery, murmuring sobs, hoping that their lost ones would return, but dead never return. They never come back. It’s hard to regain their presence. Not in this life, at-least. May God help them. 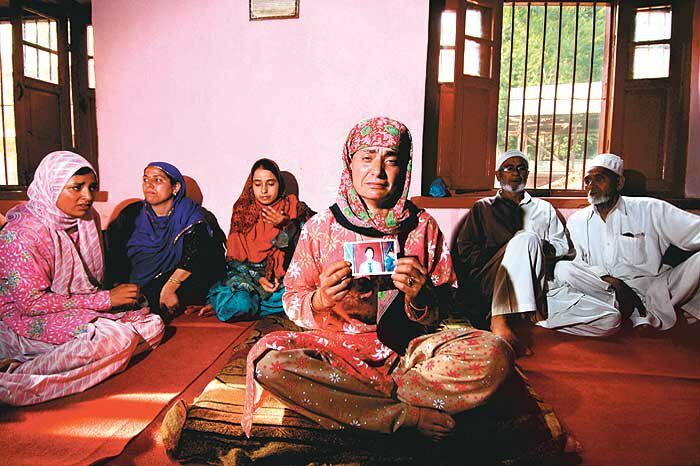 As days go by, the script of Kashmir’s misery reads like this – A school kid becomes a corpse, is one of the youngest tenants of the martyr’s graveyard. A woman, muttering through her window, observing a violent protest, down her alley, catches death with a haplessly fired canister. A youth goes to shop bakery, gets chased for life, a bullet pierces his flesh in front of his family, with a buzzing hiss. Protests gather momentum, bloodbath makes more kills. Mass media is banished to dump the truth. Pallbearers are assaulted for being pallbearers. Flag marches remind us of fascism in an unpolished democracy. Lowly compensations are granted to accept a dreadful fate. Is this a fair script for us? It has resulted in an ugly unrest with wailing mothers and hungry kids deprived of their mothers. People stone-pelt due to deep anger and frustration. It's not an organised strategy. After throwing each lump of stone, they don't feel helpless. Their anger and frustrations should be resolved, and it shouldn't be glorified by these leaders, to avoid causalities of death, for the sake of peace and an effective resolution. People have died on streets and their bodies have fallen, yet again. Still, the most common contradiction spread by Indian media is that the conflict economics is the root of the dispute. Economic stagnation can never substitute the cost of human rights abuse. Human dignity values much more than that. It’s victor in comparison. No Kashmiri would believe that economic packages would heal the suffering of Kashmiris. That would be further punitive. Kashmiris fight for identity. We want a long lasting political solution. Peace can be given by giving social justice and not by giving economic justice. A phased dialogue, involving leaders, from all strands of political thought, is the need of the hour to restore peace in Kashmir. I do agree, its not right to emancipate any kind of violence, including stone pelting, but one has to resolve to adjudicate their anger & frustration, so that they wont feel relieved after throwing every lump of stone. Also, hapless leadership of National Conference is a party to their choler, because they have failed to address the grievances of the people, by not reaching out to them. Indian influence came to Kashmir in phased stages, annexed by historic designs of National Conference. Right from independent Kashmir, to greater autonomy, to full exercise of the Indian constitution. All things which cant be morally justified, are ought to be not justified. Demilitarization, even giving 'greater or regional autonomy', to Kashmiris, will kick start the resolution. The concept of autonomy is rooted in Indian constitution. However, I believe, its not the final solution by any means, but it will surely initiate the resolution. Very recently, there have been noises coming from New Delhi governing chambers, regarding the dilution of AFSPA, the most draconian law unleashed by the Indian Parliament, functional in Kashmir and in the North-East. This much hated law allows military personnels to kill with impunity, without any fear of a court trial - which if initiated, needs to have a permission from the central government to debrief or declare the offenders guilty. That's the reason, countless cases have been left unresolved. It has also been vexedly refuted by top human right protectionist bodies. I hope these noises become constructive, without getting adulterated with competing claims and political differences. Hartaals and curfews are self-erosive and they will yield absolutely nothing, till some constructive efforts by the separatist main-stream, are initiated, with the support of New Delhi, Indian civil society & Kashmiri local administration; Pakistan also has a critical role to play. The basic basis of our struggle are rooted in liberty and sovereignty of our land. People who believe in this, belong from different strata of our society, with different approaches to the struggle; our ways of protests would be different, but the right of self-determination is critical for emancipating our struggle, and this is the most kernel thought, completely valid and acceptable, under international norms. This natural association will always bind the leaders, people of our land together, for that cherished dream of freedom. It will serve as a tribute to all Kashmiris who died for Kashmir, whatever their ideology was, and a long lasting peace, perhaps, would be the biggest tribute to them. That's why people should propose their hard-earned learning curves towards the future and enter collectively into a process of visionary introspection i.e to bring out an evolutionary model for an independent Kashmir.